William Dunning Sewall was born on 21 January 1921 in Bath, Maine.1,2 He was the son of Arthur Sewall and Laura A. Barler. William Dunning Sewall married Phebe Buckman, daughter of Dr. Lewis Taylor Buckman, on 14 April 1951 in the First Presbyterian Church, Wilkes-Barre, Pennsylvania.3 William Dunning Sewall died on 26 April 2003 at the age of 821 and is buried in Oak Grove Cemetery, Bath, Maine. Former Bainbridge resident William D. Sewall, 83, of Bath, Maine, died April 26. He was born in Bath, Maine, on Jan. 22, 1921, the son of Arthur and Laura Barler Sewall. He was educated at Choate School in Wallingford, Conn., and earned a degree in mechanical engineering from the Massachusetts Institute of Technology. He served in the United States military from September 1942 to February 1946. He was awarded two medals and several military citations. He and his wife, the former Phebe Buckman, moved to Seattle in 1951, and to Bainbridge Island in 1956. He worked as an accountant for Boeing and as a stock broker for Dominick & Dominick before owning and operating Western Tours, Inc. While in Bainbridge, he co-founded the Port Madison Yacht Club. He was a lifelong Rotarian. He retired in 1979 and returned to his family home, Stonehouse Farm, in Maine. He devoted the remainder of his life to a variety of civic and philanthropic concerns. His first project after returning to Bath was to help with fund-raising for the restoration of the steeple of the Winter Street Church. He helped open the new Maine Maritime Museum; presided over and fund-raising for the Coastal Humane Society; was actively involved in the Bath Rotary; and delivered Meals on Wheels to senior citizens. He also co-founded the Sewall Family Fund for the purpose of restoring and preserving Bath's maritime history and artifacts. His favorite charities included the Coastal Humane Society, the Bath YMCA, the Maine Maritime Museum, the Patten Free Library and the city of Bath ambulance service. [S392] Website findagrave.com (http://www.findagrave.com/) "# 45852669." [S205] Newspaper, Bangor Daily Whig & Courier, (Bangor, ME) Saturday, September 13, 1851. [S392] Website findagrave.com (http://www.findagrave.com/) "# 63063259." [S392] Website findagrave.com (http://www.findagrave.com/) "# 63434362." [S392] Website findagrave.com (http://www.findagrave.com/) "#79493385." [S205] Newspaper, Watertown Daily Times 31 May 1916. [S205] Newspaper, The Bridgeport Evening Farmer, 26 September 1916. [S130] Massachusetts Vital Records, Vol: 261 ; Page: 103. [S160] New York Times, 16 Oct 1910. [S160] New York Times, 12 Oct 1922. [S117] The Times Newspaper, Jul 18, 1941. [S160] New York Times, 16 July 1941. [S89] Family Search, Historical Registers of National Homes for Disabled Volunteer Soldiers, 1866-1938. [S392] Website findagrave.com (http://www.findagrave.com/) "# 63781582." [S392] Website findagrave.com (http://www.findagrave.com/) "# 67924517." [S392] Website findagrave.com (http://www.findagrave.com/) "# 33981259." [S208] 1900 US Census, NH CHESHIRE 3-WD KEENE. William Jesse Sewall. Publisher of the Carthage Daily Press.2 He was born on 2 June 1866 in Virden, Illinois.1 He was the son of William Winter Sewall and Susan Eva Cox.1 William Jesse Sewall married secondly Mary Taggart, daughter of Rev. Samuel B. Taggart and Frances Rockwell, on 6 September 1893 in Madison County, Illinois.1,3 William Jesse Sewall married thirdly Jean Strider on 28 July 1951 in Alton, Illinois. [S205] Newspaper, Joplin Globe, Joplin, Missouri, Friday, March 25, 1949, Page 9. [S205] Newspaper, The Kansas City Times, Tuesday February 19, 1957. [S205] Newspaper, Mexico Evening Ledger, July 30, 1951. [S392] Website findagrave.com (http://www.findagrave.com/) "# 27163134." The funeral of William Key Sewall, eighteen years old, who died at Millers, Nev., Feb. 11, will be held from the home of his parents, Mr and Mrs. R.H.F. Sewall, 1238 St. Andrew street, at 2 o'clock this afternoon. The deceased was the descendant of two old, distinguished Southern families - the Sewall family of Maryland and the Nelson family of Virginia. The first ancestor on the Sewall side of the family who came to America was the stepson of Charles Calvert, the third Lord Baltimore. Robert Sewall, the grandfather of the deceased, came to Louisiana when quite a young man and engaged in the sugar planting business operating under the firm name of Sewall, Johnson & Key. [S89] Family Search, Nevada County Birth and Death Records, 1871-1992 Esmeralda Death certificates 1909-1911 vol 3. [S205] Newspaper, The Boston Daily Atlas, (Boston, MA) Thursday, March 29, 1855. [S208] 1900 US Census, Lackawannock Township, Mercer, Pennsylvania. [S392] Website findagrave.com (http://www.findagrave.com/) "# 140641356." [S232] Ancestry.com, Ohio, Marriages, 1803-1900. [S205] Newspaper, Boston Daily Advertiser, (Boston, MA) Tuesday, November 20, 1860. [S130] Massachusetts Vital Records, Vol: 139 ; Page: 231. [S107] 1880 US Census, Sumner, Oxford, Maine. [S107] 1880 US Census, St. Albans, Somerset, Maine. [S364] Eben Graves, The descendants of Henry Sewall. Vol. II (Unpublished), #191. 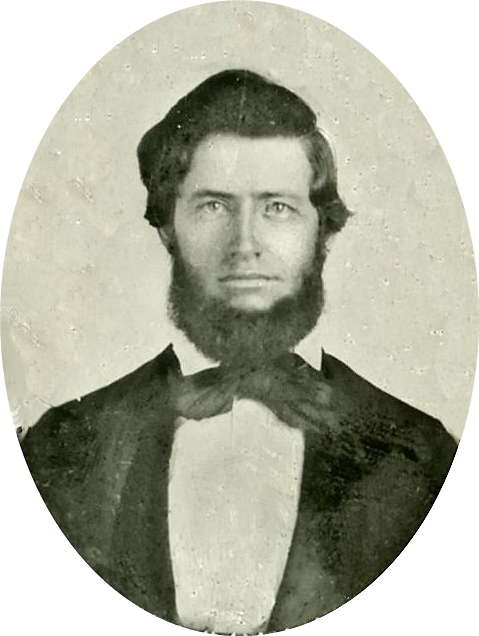 William Winter Sewall enrolled at Illinois College in 1853 and graduated in 1856. He was a member of Sigma Pi Literary Society. Following graduation, he moved to Virden, a new township in Macoupin county, about 20 miles south-east of Jacksonville which had been laid out only four years prior. He married Susan E. Cox of Virden, Il on December 9, 1858 and they had four children. A carpenter by trade, William was engaged in contracting and building, erecting many structures near Virden, including the edifice of the First Presbyterian church. In 1862 William enlisted as a volunteer in the Union army and served for three years. He was shot through the leg in an attack on Fort Blakely, a confederate stronghold near Mobile, Ala., a conflict which owing to the slowness of communication of the period, was fought after Lee had surrendered to Grant and the war was already won. He was discharged and returned home after some three months in Sedgwick hospital in New Orleans. Soon thereafter William was engaged in the flour milling business until he and his family moved to Carthage, Missouri in 1885 where he had a ten acre tract well set to fruit, just south of the city, which he started in 1886. It was then bare prairie but he built a large house and planted 1,000 fruit trees. These were chiefly pears and apples of the Duchess and Ben Davis varieties. He also had about five acres in small fruits in a flourishing condition and high state of cultivation, giving promise of fine crops. He expected to employ from 40 to 50 hands during the picking season and shipped with the Carthage Fruit Exchange, being one of the organizers thereof. [S392] Website findagrave.com (http://www.findagrave.com/) "# 84678371."